James and Catskinner scare the living hell out of Doctor Klein, who rattles on about blue metal boys, nova crew nests, and her contact Keith Morgan at The Good Earth store. She says that she killed Victor for the Book of Thoth, but before James and Catskinner can extract every bit of information from her, the police arrive. James escapes out the back and hides. Doctor Klein reassures the police until they leave, not to help James, but to keep the police from finding the backyard pool filled with algae and bodies. James sneaks away from Doctor Klein's house, jumping into Godiva's van while it's still moving. As they head towards The Good Earth, James wants Godiva, but tries to do the noble thing and distance himself from her. She wants none of that, insisting on staying close. Inside The Good Earth, James and Catskinner meet Keith Morgan, who boasts of his knowledge and influence. Keith clues James into the nature of outsiders like Catskinner, who he calls Macrobes. There is an ecology of Macrobe information beings on Earth, with several of the species in conflict. Keith is a middleman between factions, and tries to recruit Catskinner, "the child of the morning star.". The deal sounds good to James, but Catskinner refuses. Keith unleashes a water monster on James and Catskinner. Catskinner tries to fight the water construct, but cannot cut away enough mass to kill it. As Catskinner runs away from a mass of watery tendrils that cut like monofilament wires, Godiva burst in and dispels the construct with dish soap. They escape, only to run into the leasing agent that led him to The Land of Tan. She reintroduces herself as Alice Mann, part of the anti-Macrobe resistance. I missed the significance of "Debbie Sawyer" when she first appeared. Having read further, she is part of a whole set of Chekov's Guns peppered throughout Catskinner's Book. Of all the authors covered so far by the Puppy of the Month Club, Misha Burnett hides his clues and foreshadowing with the most subtlety, as mundane details often are later revealed to be significant. He avoids the current fashion of repeating foreshadowing and Chekovs three times, yet makes the revelation grounded and logical. Not once have I wondered where a particular twist or revelation came from. Normally, I space out my Puppy reading throughout the month. 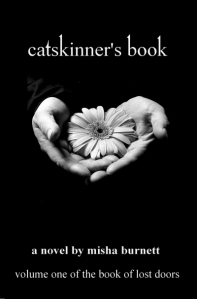 When sitting down for this post, not only did I have to continue reading past the planned stop point, I had to finish Catskinner's Book in one setting. This is high praise for a book that is admittedly not my usual fare. The beginning third might start with a slow and determined pace, but strap in as the pace and the strangeness are about to pick up speed. Next time: "She is telling as much of the truth as she understands." I am really enjoying your exegesis of my work. One of my influences for these novels was C S Lewis' "Out Of The Silent Planet" trilogy--both "macrobe" and "elildil" are lifted from that series, as are many of the attributes of the outsiders. I do believe in trusting my readers. I get really annoyed with writers who feel the need to shout, "Look, moron, it's a clue!" whenever they foreshadow things, and so I try to avoid doing that. "The beginning third might start with a slow and determined pace, but strap in as the pace and the strangeness are about to pick up speed." Boy, ain't that the truth! I'm finding the second book in the series follows the same sort of pattern.